There is an unfair standard in most societies where women are forced to choose between having a career and raising a family. But who says we have to give up one for the other. Can’t we have it all? Karen Antunes is here to say you can have it all! It is just a matter of how bad do you want it. After only eight months after giving birth to her first child Antunes has returned to the competition scene with a vengeance. Instead of becoming discouraged and defeated by what others thought she could or couldn’t do she is playing by her own rules and debunking the myth that we as women have to give up our personal dreams to raise a family. For many women competitors there is that idea that we can’t have it all. We have to give up on competing to be a mother or give up on being a mother to be a competitor. You seem to have proved that this is not true. Did you think you’d have to give up one for the other? How were you able to prove these myths wrong? 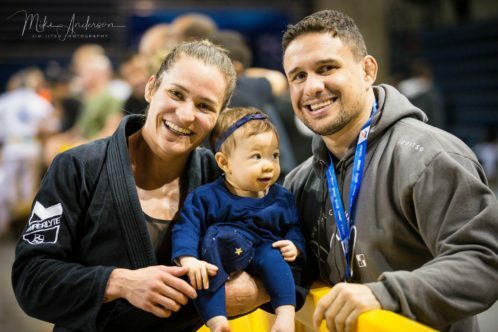 “To be honest, I admit that when I came back to training I had my doubts that I could compete the same way I had before having my daughter (Alice). I couldn’t train the same way I use to. In the first couple months after having my daughter it was so hard. I was able to train only in the mornings and I wasn’t sleeping at night. Alice sleep on top of my chest until she was three months. I had a hard time letting her cry. Everyone told me to let her cry until she learned to sleep by herself, but I was too weak to do that, so I paid the price and got no sleep. I was ready to go back to training when she was two months (after she had gotten her shots and she was able to go to the gym with me). I also found a nanny to watch her for two hours at the gym while I was training. I knew that was the only time I could train so I gave my best every single morning. Some days I was so tired before even started, but I was there, pushing myself. Some days I cried, but I was on the mat. Some days my body hurts so bad because of all the changes from caring a baby for nine months, but I was there. As a white belt I learned from my professor/husband that if I get hurt or if I can’t train it is important to keep the routine and show up to train. Even if it is just to do some technique, drills, the warm up or even just watch. She (Alice) is my priority that’s why I only can only train during the mornings. She has a routine and can’t be tired. I can’t be too stressed out that I can’t take care of her. I can’t pass my responsibility off others. No one ever changes her diapers except for me and her dad. But I can’t give up Jiu Jitsu either, so I do everything that I can to keep doing both. In my one session of Jiu Jitsu a day I try to never waste time. The rest of the day I work at the gym, teaching or doing the office work. She is always by my side or my husband and I rotate watching her at the gym. Some days my husband watches her, so I can go work out, but it is no more than two times per week. Some days I can train an hour and half (only stopping to breastfeed) and some days she only wants mommy. You have bounced back at an incredible rate from having a child and returning to the competition scene. What do you attribute your comeback to? At the 2018 Pans you breastfed between matches. It was beautiful for us to see how you were able to transition from taking care of your child’s needs to getting you head back into the game in a matter of minutes. How were you able to do this? How do you get your head in the game? What helps you with the mental prep of being a competitor? Especially when you have a young infant’s needs to tend to before your own? “My first tournament was in December at the No Gi Worlds. I trained so hard and I felt my body was ready, but on the day, I competed I was so nervous. I was only worrying about the result. All I was thinking about was what people would think if I lost. I wanted to prove that I can win again, but instead for the first time ever I just froze. I froze fighting with an extremely good athlete one weight class above mine. I was concerned about my weight, so I registered myself in the light weight division instead the feather division. I ended up taping to an armbar three minutes into the match. I felt so bad that I couldn’t fight. My body was ready, but mentally l was a mess. For many women they say having their husband as your coach and instructor has its pros and cons. Have you found this to be true for you? How are you able to separate the roles of student/instructor and wife/husband? Has becoming a mother changed your outlook as a competitor? 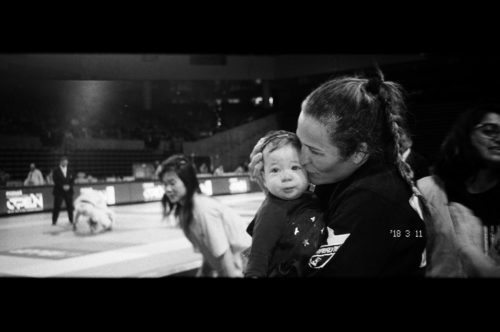 Do you think being a mother and a competitor has advantages? “Being honest I don’t see any advantage.” She laughs. What advice would you have for other women that are active competitors that also want to take on the role of motherhood? Love this article, very inspiring!